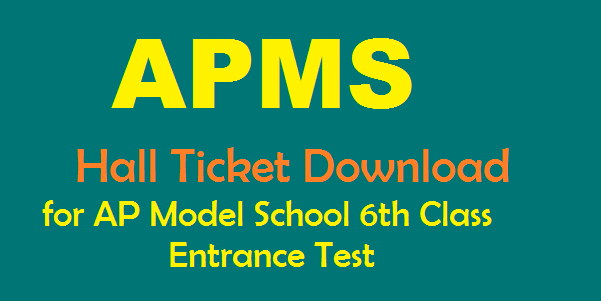 AP Model School Hall Ticket 2019 Download at apms.apcfss.in : APMS AP Model School Hall Tickets download for 6th Class Entrance Test 2019 available now APMS Hall Ticket 2019 Download for AP Model School 6th Class Admission 2019 Selection Test, Download 5th Class to 6th Class Entrance AP Model School Hall Ticket 2019 at apms.apcfss.in Government of Andhra Pradesh has announced the APMS detailed notification 2019 for admission selection test of 5th class to 6th in to the state model schools and the APMS Hall Ticket or Admit Card download allowed before 5 days of examination test schedule of commitment, according to the reports nearly 4 lacks of boys and girl students are applied to the Model School admission entrance test and they all waiting to Download AP Model School Hall Ticket 2019. The APMS notification announced on 9th January and the fee payment along submission of application service start from 10th January, registration of application service closed on 28th February 2019 through online from the APMS official portal and all meeseva and AP Online centers across in the state. Nearly 4 lacks of applications are submitted all 164 model schools from all districts in the state, now the all students need to download AP Model School Hall Ticket 2019. The Commissioner of School Education, Andhra Pradesh will issue the APMS hall ticket 2019 for all applicants for 5th class to 6th class admission selection test before commitment of the examination test by online mode only and they have confirmed the AP Model School Hall Ticket 2019 can not distribute by offline mode like they are not sent by post or courier to any applicant. The APMS hall ticket 2019 is displayed with applied student photograph, applied school and their community like BC, SC, ST or PH. Check carefully the student details on AP Model School Hall Ticket 2019 and click on print option to take a copy of printout. The Commissioner of School Education, Andhra Pradesh has issued the APMS admission selection test instructions through printable copy of AP Model School Hall Ticket 2019 for both of Telugu medium and English Medium students, every student must follow the rules to appear for the 5th to 6th class admission test and attend to allotted examination test center venue before one hour of the schedule and report to supervisor of the test center venue. The APMS Admission Selection test held at all selected centers across in the state, students can find their allotted APMS exam center venue details with address at the printable copy AP Model School Hall Ticket 2019, we advise to check the details and visit the test center before the exam date and reach early.